The Jan. 21, 2017, Women's March on Washington, the day after the Trump inauguration, stood out as a proud repudiation against what some have called Trump's tilt toward themes of racism, sexism, bigotry and intolerance. Hundreds of thousands of people -- not just women -- descended upon the Washington Mall in what became a rally founded -- not so much upon advancing women -- but upon using women's issues to denounce the newly elected President. No one could have foreseen that, amid the campfire kumbaya and so-called solidarity among women, there would emerge a serious rift over the Women's March leaders' obstinate refusal to repudiate the virulent anti-Semitism of the one of their chief supporters, Nation of Islam leader Louis Farrakhan. The recent midterm elections saw an unprecedented election of women to Congress, especially among Democrats. Among them were women of color as well as the first elected Muslim woman to Congress. However, the seeds of the Democrats' success also contain augurs of potential ruin. Two of the three co-chairs of the Women's March, Linda Sarsour and Tamika Mallory, have deep personal and political ties to Farrakhan and have been loath to repudiate him. Mallory, who is an African-American and a Chicago native, has known Farrakhan since she was a child. As a result, she considers him a personal mentor. Sarsour, a prominent Muslim-American activist, has worked closely with Farrakhan to secure rights for Muslims. Due to their personal and professional relationships with Farrakhan, neither woman has been willing to denounce him, despite a lot of pressure from within the women's movement to do so. On the other hand, President Trump has shown a willingness to distance himself from those within his own party who have demonstrated racist and bigoted views. He fired campaign adviser Steve Bannon over what many saw as the fallout from Bannon's advice to Trump following the white nationalist protests in Charlottesville, Virginia. The Trump administration has also parted ways with counterterrorism adviser Sebastian Gorka over controversy after he was seen wearing a pendant representing Nazi-linked Hungarian nationalist organization Vitezi Rend, which provoked outrage among Jewish groups. Once it was revealed that White House speechwriter Darren Beattie had spoken at a convention with three avowed white-nationalists, he was also fired. In short, Trump has cleaned house of those with the same bigoted, racist views that Trump himself is accused of holding. Given Trump's ability to do so, why is it so hard for the supposedly liberal, anti-racist, Women's March organizers to clean theirs? 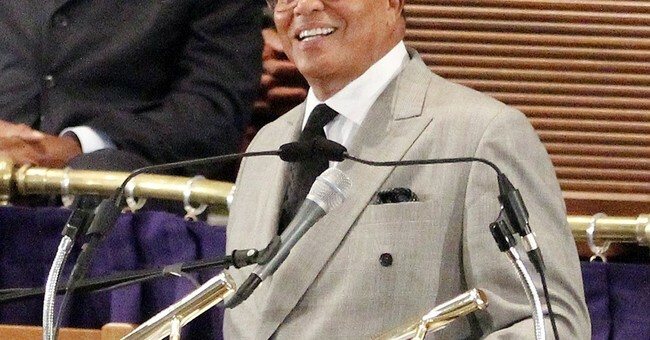 What is it about Farrakhan that they simply cannot seem to shake? Well, the problem is actually pretty simple: On a fundamental level, both Mallory and Sarsour identify with Farrakhan's views. They each have reasons to have a fraught relationship with the Jewish community, and it might prove to be their undoing. Essentially, they both believe -- as women, as people of color and as Muslims -- that any racism and prejudice in their midst is inconsequential. In other words, because they are not the dominant part of the American power structure, their prejudices do not affect Jews in the same way that bigotry toward blacks or Muslims affects those communities. They also seem to think that building coalitions with organizations like the Nation of Islam gives them credibility in the minority and Muslim communities, in a way that solidarity with Jewish and white women does not. They are, in essence, saying that their power base is not with women at large, but with a subset of women -- namely, those of color and Muslims. In reality, these women are proving that they are not ready for primetime. They have had far, far more chances to repudiate anti-Semitism than the Trump administration has been given to repudiate white nationalism. If the Women's Movement wants to be taken seriously as a counterpoint to Trump on a national stage, they must shed these associations. Their unwillingness to do so betrays a "victims" mindset, not an openness to embrace the true aspirations of all Americans to live in a colorblind, gender-neutral society in which everyone's faith is respected and honored as a core feature of our American experiment. The consequentialist argument only works when one assumes that their words and actions don't matter. This type of political impotence is impossible to square with the level of agency and responsibility it requires to lead a national movement. At the end of the day, it is childish and ineffective. By not distancing themselves, they are not gaining allies and supporters or spreading influence. Instead, they are merely speaking to the choir and hearing the sound of their own echo. This should indeed be a time of triumph for women, Muslims and people of color -- many of whom were elected in districts (such as Minnesota's 5th Congressional District) with a majority of white American constituents. White Americans took a chance on them, believing that it is not one's gender or color or religion that makes them competent to lead, but the content of their character and strength of their ideas. Unless the leaders of the Women's March wake up to this reality quickly, they are likely to lose the ground they have gained -- which would be a shame for all Americans.